Amazon is doing same-day shipping in various markets, partnering with the USPS. Google is testing same-day shipping services. eBay is executing same-day shipping in various markets on behalf of major "brands". If you live in an urban area, you are blessed. You have 50mbps internet, and eBay will get you something from Macy's in sixty minutes, for free. If you live in a rural area, well, thanks for playing. 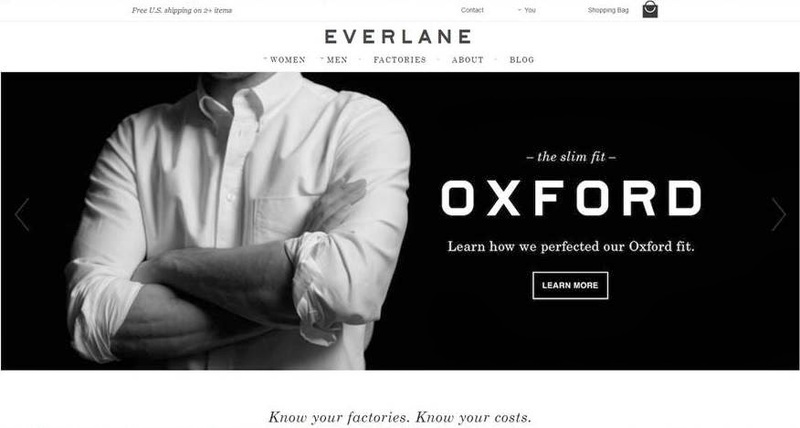 You have 3mbps internet, and Lands' End will get you an order in ten days with free shipping. Businesses are sifting into tiers as well ... the 1.0 generation (Amazon / Google / eBay) using same-day (or same hour) shipping to compete against retailers. Retailers, meanwhile, are being distracted with the obviously misguided strategy of turning a mall-based store into a digital distribution center - I mean, be honest - name a customer who wants to get into a car, drive 20 minutes, try something on, realize the right size is not available, then get it shipped next-day from a store in Dallas when the customer could get the same item (or comparable enough of an item) in three hours from Amazon without ever leaving home (and possibly not paying sales tax, either)? Be honest, folks. Omnichannel cannot compete with that. Omnichannel is a distraction that benefits vendors, and provides a temporary sales lift for retailers that did a poor job of stocking/fulfilling merchandise in the past. And worse - read this (click here), eBay now turns Best Buy and Office Depot and other "brands" into nothing more than glorified eBay vendors. The retailer perceives a competitive advantage, while eBay captures (big) data and invades the customer relationship. Long-term, this is going to become a problem for retailers - much in the same way that the Borders / Amazon relationship was a disaster for Borders. You simply don't want a competitor hijacking the customer relationship, folks. It's one thing for FedEx to insert itself into the customer relationship. 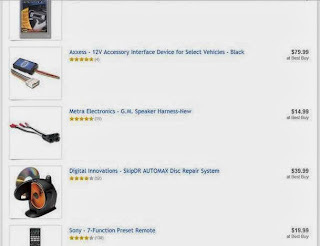 It's quite another thing for eBay or Google to insert itself into the customer relationship (image below from the eBay Now site - selling Best Buy products - with Best Buy disconnected from the customer relationship - now nothing more than an eBay vendor - go #omnichannel). They're trying to destroy you, my dear retail clients. And the punditocracy is cheering them on. Catalogers, meanwhile, are being thoroughly out-hustled. Amazon/Google/eBay have taken the fight to retailers, and have won Jennifer in the Judy / Jennifer / Jasmine equation (won via e-commerce and service. With Jennifer won over, the fight is for Jasmine (and that fight will be won via mobile and service). Catalogers, meanwhile, applied a "multi-channel" approach of using paper to push customers online. Judy, with her 3mbps online presence and no opportunity of ever getting a delivery in the next-hour from Macy's via eBay, is locked-in to catalogs ... for another 5-10 years ... and then what? Catalogers are going to have to unite - Amazon / Google / eBay have "scale", as the pundits say. Catalogers, in total, have "scale". Catalogers can get what we want, but it's going to have to be as a unified front, all working together. P.S. Don Libey once called malls "future Cities of the Dead" (click here please). That was 2005. Here we are, nearly a decade later, and we're hyping the process of turning a mall-based store into a digital distribution center. In a world where eBay delivers a Best Buy product to your home in one hour, describe what type of a retail experience Best Buy can provide that would cause you to get in your car, battle traffic, drive 20 minutes to a store, and then stare at a bunch of merchandise? P.P.S. If this omnichannel customer is so darn valuable, then explain why 27% of e-commerce happens at Amazon? Wouldn't the most valuable customers shun Amazon in favor of a branded, retail + catalog + online + mobile experience offered by the omnichannel merchant? Ok folks, it's the day before Thanksgiving - and you're not doing much anyway, so why not give this little ditty about Target a read ... click here ... go ahead, I'll wait for you. It's a fair argument, one that screams for an "omnichannel solution", as the kids say. Yes, an omnichannel solution would work - an in-house app linked to a bunch of data linked to 3rd party apps would get the customer the lowest price and would get a product shipped to a home on the same day. Woo-hoo! Here's my question for you, the intrepid Executive / Marketer / Analytics Expert. Why not offer the best price 24/7/365? When is the last time you've been in an Apple store, with customers using their phones to price check to make sure that the iPad is truly at the lowest price? When is the last time you've been in a Bose store, with customers using their phones to make sure they can't get a Wave radio at a lower price at Best Buy? Omnichannel ... it's a solution to a problem that doesn't have to be a problem. Think about it. Why does the customer in the checkout line at Target have to go download some wonky app to make sure she is getting the best price? Honestly? Why? She has to do this because she can't trust Target. That's why. She knows Target is probably ripping her off. That's why she has to download a 3rd party app. And then she has to ask the checkout associate for a better price, and the associate gives her the better price, and then everybody in line behind the woman knows they, too, are being ripped off. Then they all ask for the best prices. Omnichannel solutions work if you were already cheating the customer. Fair pricing works for every customer. Is it possible that we're stuck in a fog? 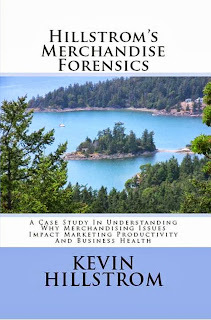 If you are a catalog marketer, then give this little ditty from Bill LaPierre a read (click here). The insights you get from reading Bill's blog are just a bit deeper and more meaningful than "8 Reasons Why Social Media Will Save Your Holiday Season". Read the "GREAT MERCHANDISE" paragraph (click here, look for the heading). I won't repeat what he says, he wrote it, you should read his content on his site. 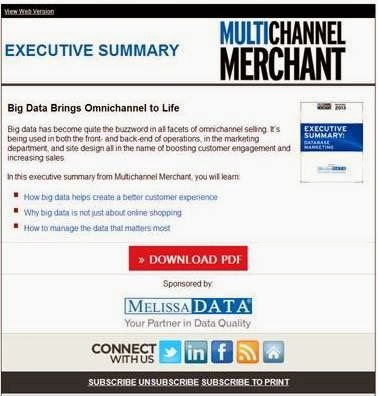 "Big Data Brings Omnichannel to Life". Big Data and Omnichannel strategies keep vendors in business. This is THEIR new product, THEIR new merchandise offering. Here's another ditty ... "FOLLOWING ORDERS, NOT CHANNELS (click here)". The entire article then talks about channels. After you read five thousand or ten thousand of these articles, articles that tell you what you "must do", you come to a realization. The media ecosystem is diving head-first into their version of new merchandise. By paying attention to the media ecosystem, we ignore merchandise, focusing instead on topics like Omnichannel and Big Data. By ignoring merchandise, we disappoint our customers, causing them to spend less. When our customers spend less, we look to the media ecosystem for solutions, solutions that have nothing to do with merchandise (but everything to do with new merchandise for those in the media ecosystem). In other words, the media ecosystem focuses on their version of new merchandise, and their focus ultimately distracts us, the readers, from focusing on our new merchandise, hurting our businesses, causing us to focus even more on their version of new merchandise. I keep talking about merchandise, and for good reason. In my projects, merchandising issues account for +/- 10% of annual sales - and they compound, like interest, over time. Merchandise is within your control. And in so many cases, merchandise is being ignored. It's almost like we're in a fog - we can't see what is truly important - with the media ecosystem using a fog machine to further blind us ... not intentionally, mind you ... they're doing it so that they can stay in business by selling their version of new merchandise. I ran a veritable plethora of trial "Hillstrom's Heath Index" projects in October - and it became very, very obvious what matters most (click here for file layouts - cost = $4,950). Number 5 = Increased Spend per Customer. 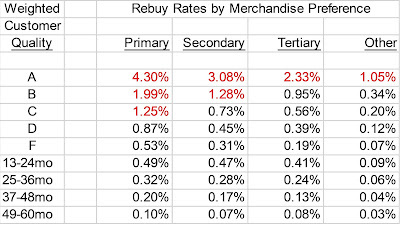 Number 4 = Increased Customer Loyalty via Increased Repurchase Rates. Number 3 = Increase in Number of New, Winning Items Each Year. Number 2 = Positive Balance in New/Reactivated Customers vs. Lost 12 Month Buyers. Number 1 = Overall Increase in Merchandise Productivity. What trade journalists, bloggers, and vendors ask you to focus on. Number 3 = Omnichannel - Aligning All Channels Around Digital Initiatives. Number 2 = Increased Spend per Customer. Number 1 = Increased Loyalty via Channels, Discounts, Promotions, Loyalty Programs. Do you see the significant difference between the two lists? You'll have to look far and wide to find somebody talk about the importance of merchandise. I had a person tell me on Twitter that it is critical to find the right promotion for the right customer at the right time. Well, that may be true - but what exactly is the customer going to purchase with the right promotion at the right time? I was in a meeting recently, and I told the CEO that "the data suggests that customers don't like your merchandise anymore." Well, you would have thought a bomb went off in the room! Mind you, I had data that showed a significant and prolonged drop in merchandise productivity, but the room hated the message. Hated it! They thought that they might not be applying the right promotional mix to the business. I was in another meeting recently, and the topic was channel alignment. The thesis was that if channels (mobile, retail, e-commerce, print) were better aligned, customers would spend more. Look at what Microsoft does with channels. They have a tablet that is every bit as functional as an iPad. It integrates with killer apps like Outlook, Word, Excel. It's cheaper than an iPad. The desktop channel and the tablet channel and the mobile channel (Nokia 41 megapixel camera, wow) are all aligned and integrated. It doesn't work because of merchandise. Merchandise is what matters. Your iPad needs apps to work properly. The combination of tablet and apps represents merchandise. So the metrics that matter most are merchandise related. You keep hearing stuff like "the customer is in charge". That's garbage. The customer is in charge of deciding what to do based on the information you provide the customer. If the merchandise isn't desirable, then what the heck difference does everything else make? Measure the metrics that matter most. Allow me to take a brief moment to tell you about a dream I had last week. Yes, I promise, the dream has everything to do with business. See if you can spot the symbolism in the dream. I'm staying at a hotel in Cannon Beach, OR. 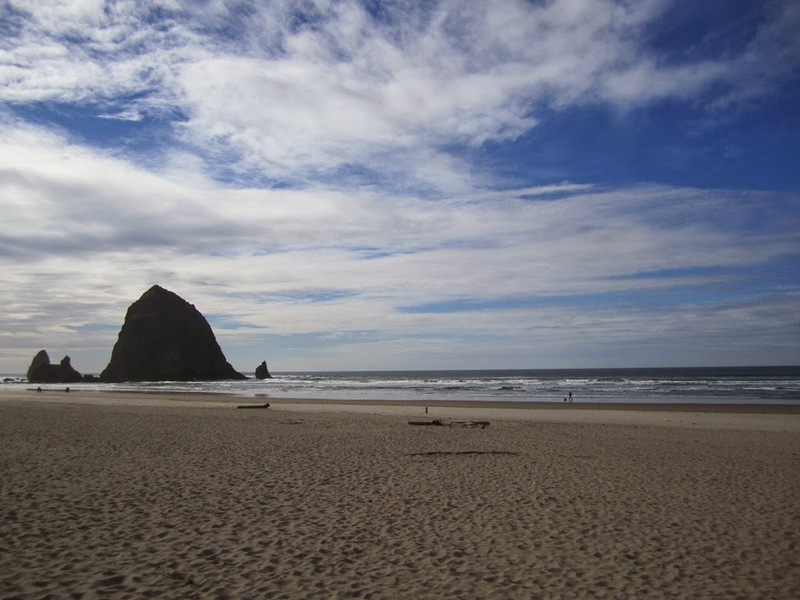 (Haystack Rock is depicted here). I'm hosting a party. Maybe fifty to one hundred people are attending. I look out on the ocean, and guess what I see? Tornadoes ... or as they're frequently called when appearing over water ... waterspouts. With danger approaching, I scream "tornado", and point vigorously to the ocean. Nobody listens to me. So I run inside to tell my wife, a person who runs a catalog business, and a doctor that a tornado is fast approaching. I tell them that they must head to an interior room to protect themselves. These three people, whom I consider "smart", move to an interior room, though they do continue to enjoy the party, not embracing the true danger that I'm sensing. 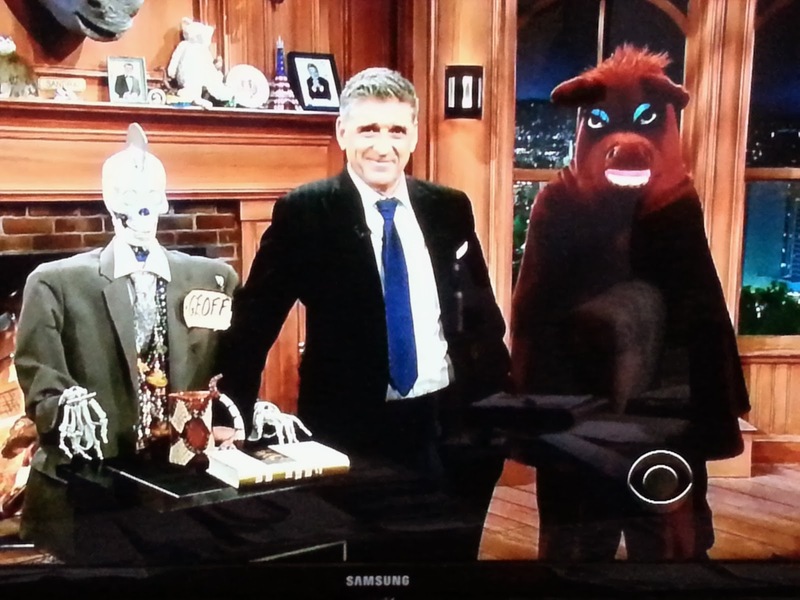 In fact, these three individuals perceive my actions as being a bit annoying, to be honest! I head back out to the main room, and I notice that all of the party goers have assembled on the deck. They're sitting in chairs, pointing at the tornado that is now just a football field away from them. They're oblivious to what is coming. I scream at them to get inside, to get to an interior room. They ignore the information provided to them. They raise their drinks as the storm approaches, cheering it on, celebrating. Then, suddenly, one person in the crowd says "Oh my goodness, the tornado just killed that person." The crowd looks over the deck, stunned that people on the ground are dying. How could this be? The crowd looks up the coast, as a separate tornado destroys a water park that hosted numerous tourists. The crowd is stunned, but they don't move, they don't take cover inside. Seconds later, the tornado hits the deck. Mass carnage ensues. I run inside, sprinting to the kitchen. I pick up my keys and wallet from the counter top, thinking "at least I have the keys". The tornado hits the interior of the building, where I am swept up into the air. It's fun to sit on the sidelines and cheer concepts like "omnichannel". Sometimes you have the keys, and you can unlock the problem. Like with Merchandise Forensics. A CEO recently told one of my readers that "this merchandise stuff is like magic". I've analyzed a ton of data in 2013. The data continually suggests that a storm is brewing. Many of us failed to invest in new products, and are now left with dying products that are not being replaced fast enough to maintain sales levels. Most of us are rapidly shifting the e-commerce side of our business to mobile (adapt or die), only to find that conversion rates are awful (often because we simply cannot feature enough merchandise to increase conversion rates in a mobile environment). Or worse, we find out that our customer is 61 years old, and is never going to "engage" with a mobile device like a 28 year old will. Will we fix the problem and save ourselves? Will we head to an interior room and at least protect ourselves? Or will we take a seat on the deck, pour ourselves a drink, and cheer as the storm approaches? We keep reading about Best Practices - rules that you must follow, or your performance will be sub-optimized. Where, in the pantheon of talk show excellence, is there a best practice stating that instead of employing a co-host, you trot out a robot and a fake horse? Keep this in mind the next time somebody recommends that you focus on Best Practices - asking you to play it safe. Only 3 Are Web-Only: Amazon, Netflix, Newegg. Interestingly, Amazon represents something like 25% of all e-commerce. Geez. A whopping 17 are retail brands: Staples, Wal-Mart, Sears, Office Depot, Best Buy, OfficeMax, Macy's, Grainger, Costco, Target, Gap, Victoria's Secret, Williams Sonoma, Kohl's, Barnes 'n Noble, Nordstrom, Toys 'R' Us. From 30 to 100, somewhere north of 35% of the businesses are classified as web only. From 101 to 200, about 30% of the businesses are classified as web only ... with annual sales of about $150,000,000 ... totaling $15.0 billion ... about 25% of what Amazon does. From 201 to 300, about 35% of the businesses are classified as web only ... with annual sales of about $75,000,000 ... totaling $7.5 billion ... about 12% of what Amazon does. From 301 to 400, about 40% of the businesses are classified as web only ... with annual sales of around $37,000,000 ... totaling $3.7 billion ... about 6% of what Amazon does. From 401 to 500, about 55% of the businesses are classified as web only ... with annual sales of around $25,000,000 ... totaling $2.5 billion ... about 3% of what Amazon does. From 501 to 1,000, about 58% of the businesses are classified as web only ...with annual sales averaging $7,500,000 ... totaling $3.5 billion ... about 5% of what Amazon does. This should cause us to pause, to think. Amazon did $61 billion last year. Companies 2-10 did $50 billion last year. Companies 11-100 did roughly $110 billion last year, +/-. Companies 101-1000 did $32 billion last year. The "1%" in e-commerce generate more than 40% of e-commerce volume. You were promised that "multichannel" would cause you to be successful. Remember all that mindless hype? Vendors, trade journalists, bloggers, consultants, they all told you that a combination of your catalog and e-commerce was unbeatable. Those folks, with no skin in the game, sold us a story. 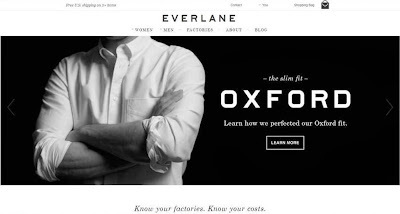 While we focused on being multichannel, retailers transitioned their catalog business to e-commerce (like when I worked at Nordstrom), or they increased sales by 10% by adding a direct marketing channel that was previously (and foolishly) missing. And Amazon, following a decidedly non-multichannel model, became e-commerce, mulching all of us in the process. It turned out different than the experts told us it would turn out. There's the 1%, and then the rest of us. The majority of e-commerce brands, as illustrated above, became niche players unable to crack the $30,000,000 barrier. There's something magical about that $30,000,000 level ... it's where the easy work ends, it's where the spending begins. And there's only so much you can spend in classic e-commerce (paid search, retargeting, affiliates, um, uh, hmm) before you have to branch out and try something different (or generate improved merchandise productivity). So everything we were told was wrong. The average e-commerce business fills a niche. Retailers finally started a direct marketing channel, and because of sheer volume and brand equity, sucked the life out of direct marketing. And Amazon won the battle. Online, there's always one winner. Well, we've always been niche focused. No, not L.L. Bean, but if you are Cuddledown of Maine, you were never going to hit a billion dollars in sales. And because of our lust for a multichannel model, because we overstated our matchbacks in order to keep mailing catalogs, we found our niche. Our niche, of course, is 55+ rural customers who love being romanced via paper. A pivot to a 28 year old shopper will require pain, coupled with a low probability of success. A pivot to a 44 year old shopper is possible, but requires taking Amazon head-on. Good luck. It's time to start giving serious thought to what the future looks like. The "multichannel" strategy of the past decade didn't work. Where do we go from here? Click here to learn more about the business model. 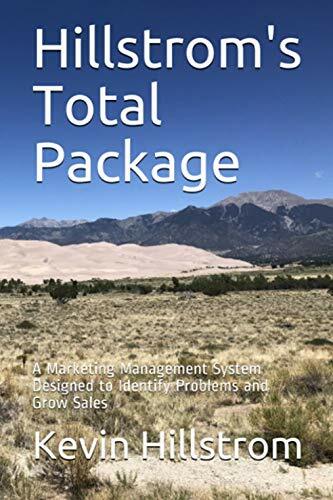 And here's an article about the business model - full price all the time, buy small inventory quantities and sell through them - and be transparent about cost of goods sold to the customer (click here please). You'd almost think you were looking at the rebirth of Lands' End, two generations removed. Now, let's be honest. They may not make it. There's that dilly of a $30,000,000 pickle (annual net sales) that seems to be a real hurdle that is tough to get over. Even more interesting than transparent pricing is the inventory strategy ... always buying "too little" inventory to satisfy demand. I remember seeing this type of model when I worked at Nordstrom - once you've been burned by liquidations, you don't ever want to have too much of anything. So if you can get 80% of what a customer wants, or 70%, then yes, you're going to disappoint a lot of customers, but you're also going to create urgency. Too many businesses create urgency by having short-term promotions (40% off on Cyber Monday only). You can create urgency by telling your customers to get it now, before it is gone ... and do that at full price. Readers - I may be looking to partner with an attribution/matchback vendor on a thousand lines of interesting code that allows me to see how customers behave in the future, based on advertising investments made today. Who do you like working with? Why do you like working with them? Send me an email (kevinh@minethatdata.com) with your preferred attribution/matchback vendor, and what impresses you about the folks you work with. There are three places where you can truly tell what a business/marketer cares about. Home Page ... classic or mobile. 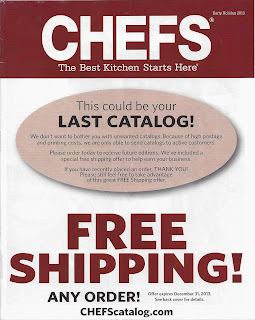 This catalog cover tells us that Chefs loves catalogs. 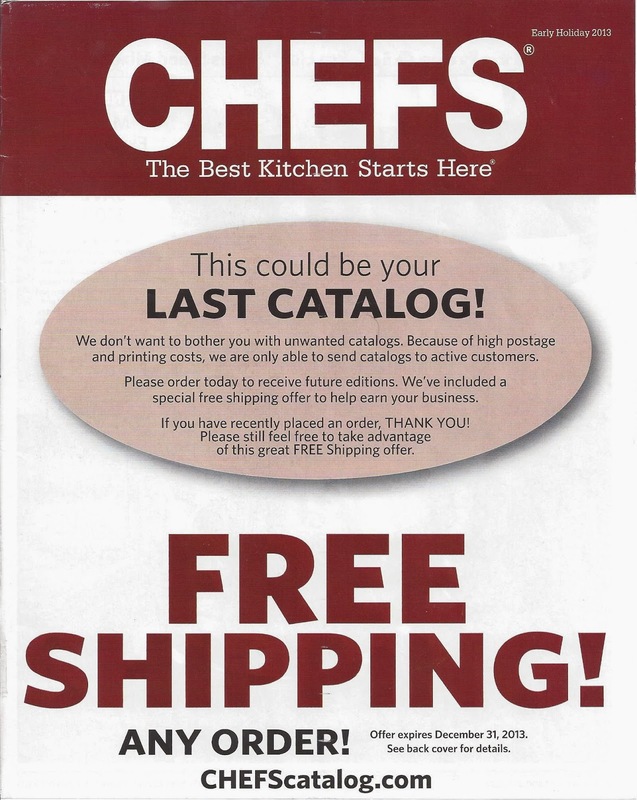 They love catalogs so much they hold the customer hostage. You may remember this tactics from the early 90s, when, if you were cut off, you didn't learn about the business anymore - that was truly it! How much merchandise do you see on the cover of this catalog? We see three items featured, so that's good. Now, how many discount/promotional messages do we see? Save $20 on a Roasting Pan. 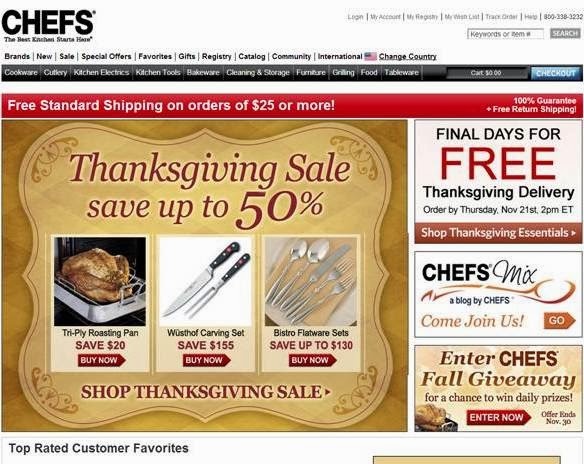 Save $155 on a Carving Set. Save up to $130 on Flatware. Final Days for Free Thanksgiving Delivery. Fall Giveaway, Chance To Win Daily Prizes. Thanksgiving Sale - save up to 50%. I count at least nine sale/promotional message. Nine. Heck, valuable home page real estate is given to a blog ... a BLOG! If we go below the fold, then we see merchandise - six of the top eight items are on sale, furthering the sale messaging to the customer. 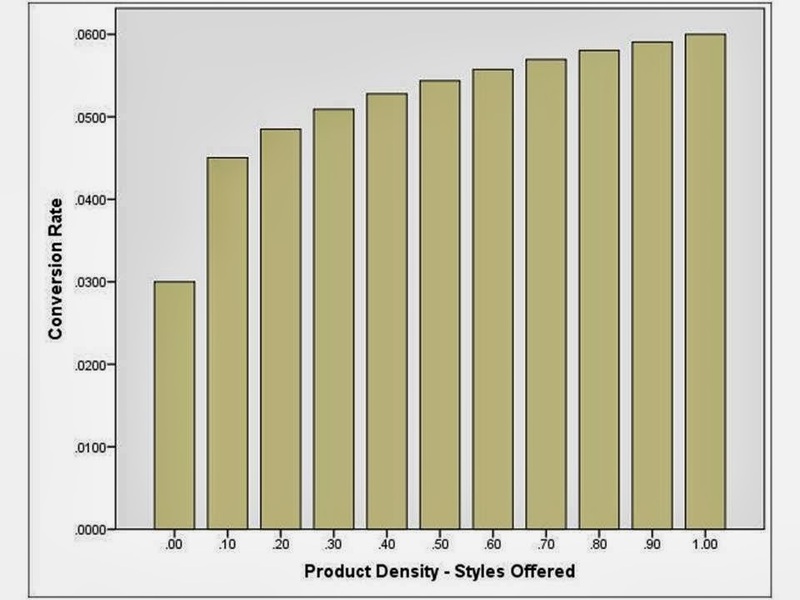 Yes, they're favorites, and we know what happens in the Merchandise Forensics framework when you over-emphasize best sellers and do not develop new items. But items are featured. Interestingly, the items are "customer favorites" - not the items that the merchants/marketers are passionate about. I am not saying that this style of presentation leads to above/below average conversion rates. I am not saying this strategy is right/wrong. I am only saying that we know where merchandise stands on the pecking order. Amazon mulched all of us. Amazon relentlessly pushes merchandise at us. Pay close attention to what companies feature in email, on the home page, on the mobile home page, and on catalog covers. You'll learn what the company truly values. And as we all know, we attract customers who share our values. Here's one for you - give this a read (click here). Everybody has a different take on what "omnichannel" really means. Too often, it's an "inventory / fulfillment" solution. We can turn physical stores into digital distribution centers. Or, we could figure out what makes for a magical retail shopping experience in an era where every piece of knowledge ever contained in the world is available in one's own hand, on demand. The latter is the real issue. Well, you've been humiliated once again (click here please). 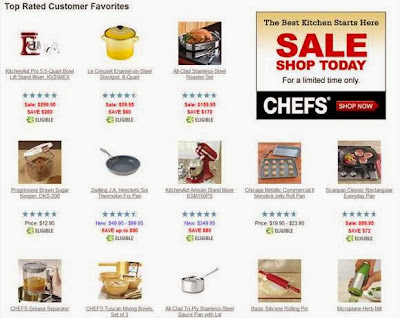 You sold your wares on Amazon, teaching Amazon what sells and what doesn't sell. Amazon used that information, and is now headed toward $100,000,000,000 (yes, that's one-tenth of a trillion dollars of annual sales ... it will take less than three years to get there at current growth rates). In a total market where growth is at or less than inflation, that level of sales volume has to come at your expense, don't you think? Meanwhile, you are busy lobbying a dysfunctional Congress to keep the USPS viable. You are fighting to help the USPS, because, of course, helping the USPS stay viable allegedly keeps your business viable. Considers ending Saturday delivery of your catalogs. Strongly considers significant postage increases - charging you significantly more for the same level of service. Provides your biggest competitor, a non-cataloger named Amazon, a business that does not fund the USPS via the kind of postage you pay, exclusive Sunday delivery of their products in major markets (NY/LA this year, many more next year), helping run you out of business even faster. How utterly feckless can our industry be? I mean, you paid postage for decades - decades! You funded the pensions of the very Executives who decided to sell out to Amazon - and I get it, Amazon is getting close to being bigger than all of us put together, it's hard to blame the USPS. But come on! Do you treat your loyal customers this way? This tells us that the future of the USPS is not the mailing of pieces of paper - it's the delivery of merchandise. When viewed via that perspective, Amazon should get top priority. Remember, you funded the USPS so that they could get to this point where they pivot to serving Amazon better than they serve you. Our industry is Charlie Brown, with the USPS + Amazon playing the role of Lucy, pulling the football out at the last second of an attempted kick. It's common for postage to represent 5% to 10% of annual net sales - often equal to 50% to 80% of all other fixed costs incurred by your business. Think about that whopper of a statement for a moment. You spend more on postage than almost anything else. How has your loyalty been recognized by the USPS? When are you going to stand up for yourselves and say "ENOUGH"? As Lucy says at the end of this video ... "Isn't it peculiar, Charlie Brown, how some traditions just slowly fade away?" (click here for the video if you follow via email or RSS). The USPS/Amazon Sunday partnership helps facilitate the evolution of our tradition. Only you can fix this. You know what you have to do to evolve. Your future involves spending much less money with the USPS. Time to get busy. It's clear the USPS and Amazon don't care about you. We knew Amazon didn't care. Now we know how the USPS feels about you. Get busy. 1 - If we learned the cautionary tale that you kill yourself when you stop offering discounts and promotions (i.e. JCP), then why was JCP struggling so badly leading up to 2011 when it still generously offered discounts and promotions? 2 - If omnichannel and bricks 'n clicks are the future, then how do you explain why Borders went out of business? Bonus questions ... how do you explain that Barnes and Noble didn't gain market share when Borders went out of business ... and how do you explain that Amazon, without a retail presence, sells books and eats into retail book store market share? 3 - If omnichannel and bricks 'n clicks are the future, then why did Blockbuster Video die while Netflix thrived? Wouldn't the retail presence have been enough to crush Netflix? And if your answer is that Blockbuster made key strategic errors, then shouldn't we be worrying about merchandising/service strategy first while giving omnichannel very little attention? 4 - Assume that omnichannel and bricks 'n clicks are the future and Macy's is the omnichannel poster child for omnichannel success. Why, then, is Macy's consistently posting negative comp store sales results? And if your answer is "it's merchandise, stupid", then why are we choosing to not focus all our efforts on merchandise? 5 - If catalogs are a vital part of an omnichannel future, then why have total catalogs mailed declined by a whopping 40% in the past six years (click here)? 6 - If mobile is the future, and it most assuredly is the short-term future, and if most folks will access your brand via mobile within three years, then why are mobile conversion rates so horrifically awful, even among rabid early adopters, and what does that mean to the future of e-commerce? 7 - What does it mean for the future of catalog marketing when the average catalog customer is sixty years old? 8 - Explain why Safeway requires a club card for cheap prices and loves couponing, but Trader Joes can sell at full price and thrive? 9 - Why do you happily pay Amazon $79 a year ahead of time to get products shipped to you, but you won't buy from your favorite e-commerce brand unless they offer you free shipping? 10 - What did Amazon do different than everybody else to achieve an approximate 25% e-commerce market share? And why do we think that the solution to this battle is to simply become more "omnichannel", a solution that seems to have only helped Amazon get bigger? 11 - How do you plan on keeping your business on level ground under the assumption that Amazon could represent 40% of e-commerce in five years? 12 - Why does Forrester Research promote a digital / social / mobile / big data / omnichannel future, but use Direct Mail to generate business? Furthermore, why does Forrester Research describe their own social media practices in their 2012 annual statement as not materially moving the sales line? In other words, why is the research brand responsible for promoting a digital future not capable of fully leveraging digital for it's own future? 13 - Of what value is it to generate $2,000,000 of Cyber Monday demand at 30% off plus free shipping at a 40% gross margin when you could generate $1,000,000 of Cyber Monday demand at full price and a 60% gross margin? 14 - If "All Magic Comes With A Price", why are so many of us willing to pay that price? 15 - Why would the USPS consider cutting Saturday service for catalogers while jacking up the price of a catalog mailed to a customer, but happily accept money from Amazon to deliver Amazon's packages to your home on Sunday in major markets, helping put you out of business in the process? Discuss. 16 - How, in a mobile environment, do you plan on sharing your full assortment with your customer, when you are so limited by what you can share with your customer in a mobile environment? 17 - If you promote an omnichannel future of sameness across all channels, then why do you allow your email marketing team to offer discounts and promotions that are not available to best customers who fully use all other channels but do not subscribe to your email channel? 18 - If you built a business on search engine optimization - in essence - if you built a business on free traffic and free information from Google, then aren't you, and not Google, accountable for the problems you face now that Google has essentially repealed organic search keyword information? Remember, all magic comes with a price. 19 - How many new products did your company launch in 2013? What percentage of these products became best sellers? How did this rate change vs. 2012? If you don't know the answer to these questions, describe the ways you are at a competitive disadvantage to those who know the answer to these questions. 20 - Why do you match back orders to your catalog that would happen anyway, even when you have the mail/holdout test results to prove that you should not practice this "best practice"? Are you worried about what will happen to the future of your catalog if you do what is truly most accurate and most profitable for your business? 21 - If you ask 100 attribution vendors to allocate orders to marketing activities, and you get 100 different answers, how exactly do you know which answer is the right answer? 22 - If all channels are supposed to be representative of our brand, and by aligning all channels perfectly we achieve omnichannel excellence, then please describe why Microsoft, first with the Zune music player, and today with the Surface tablet (which integrates with your desktop so well that you can use Outlook or Excel or Word - killer apps, right), is unable to make a dent on what Apple accomplished? And if your answer is that Apple has all the apps, well, then didn't you just prove the point of how meaningless omnichannel really is, because you've just demonstrated the importance of product (apps)? And if you've just demonstrated that product/apps/merchandise are so important, then why are your practices and analytics not aligned around merchandise in the first place? Discuss. 23 - If social media engagement is the difference between success and failure, then wouldn't Best Buy, with their Twelpforce, be crushing the competition? 24 - If social media should not be measured via sales and profit, but instead, via engagement and metrics aligned with anything that is non-revenue producing, then describe why your company should continue to invest $80,000 in salary plus benefits for your position, when your company could invest your $80,000 salary in paid search and generate $250,000 of sales and $20,000 profit? 25 - Is it possible that you and your co-workers, and not vendors / trade journalists / bloggers / social experts / mobile experts / management consultants / researchers, are most knowledgeable about the dynamics surrounding customer behavior at your business? Here's a way to think about conversion rate, in absence of marketing activities. Your "brand", if you will, is responsible for generating half or more of your conversion rate. Customers decide they want to buy from your business, generating a significant amount of the conversion rate. After we account for customers who "had an agenda" and were going to buy, regardless, we have everybody else. These customers need to be informed. We inform customers via merchandise, we inform customers via discounts/promotions, and we inform customers via creative/imagery. 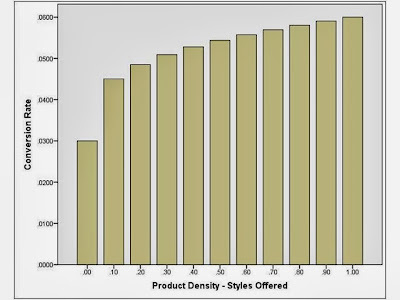 And when we minimize the amount of information presented to the customer, we minimize our conversion rate. This is happening in mobile. We're unable (at this time) to provide as much information as we can on a website, or via a catalog. This drives conversion rates down. When we drive conversion rates down, we respond by offering deeper discounts/promotions, or we gamify the experience (cheap prices end at 11:00am, act now). When we attract customers via discounts/promotions, we shift the focus away from merchandise. In other words - mobile is (at this time) shifting the focus away from merchandise. The form factor employed by mobile demands this - the customer has to know what the customer wants before hand, using mobile to simply transact. The art of getting the customer to "shop" is, at this time, not part of the mobile experience. Just as interesting - when we reduce the amount of merchandise featured on a mobile website, we, by default, try to jack up conversion rates by offering the best products, the ones most likely to increase conversion rates. This leads to a small amount of highly productive "winners", and everything else that sells less well - in fact, selling at lower rates than forecast, causing us to have to increase liquidation activities, hammering gross margins in the process. The whole process is quite interesting to observe. The ramifications are significant, and worth considering. Do you really want to optimize your email marketing campaigns? And no, I'm not talking about A/B testing 30% off against 10% off plus free shipping - that doesn't push the peanut. No, it's time to help your merchandising team. Pick eight new items that have sold reasonably well in October/November. Randomly match up the eight items, in a tournament bracket. In email campaign #1, match up item 1 vs. item 2. Tell the customer you're running a tournament, and the item that sells best "wins", and advances to the next round. In email campaign #2, match up item 3 vs. item 4 - same premise. In email campaign #3, match up item 5 vs. item 6 - same premise. In email campaign #4, match up item 7 vs. item 8 - same premise. In email campaign #5, match up the winner of 1/2 against the winner of 3/4. In email campaign #6, match up the winner of 5/6 against the winner of 7/8. In the championship, match up the winner of 1/2/3/4 against the winner of 5/6/7/8. What do you get for doing something like this? Your customers will tell you the new items that they like the most (let them "like" various items - measure via sales (80%) and likes (20%) - sort of like "Dancing With The Stars", if you will. You promote/advertise new items, and based on my work this year, most of us desperately need to promote/advertise new items. You do something different than the same, boring, 20% off plus free shipping that plagues email marketing. You can promote the tournament bracket across Facebook and Twitter - pleasing the omnichannel advocates to no end - you partner with your customers. Think of the virality of it all?! You "engage" your email subscriber list - theoretically pleasing everybody. What would stop you from doing this? What would stop you to focus on selling, to not focus on teaching your best customers about your best new items?